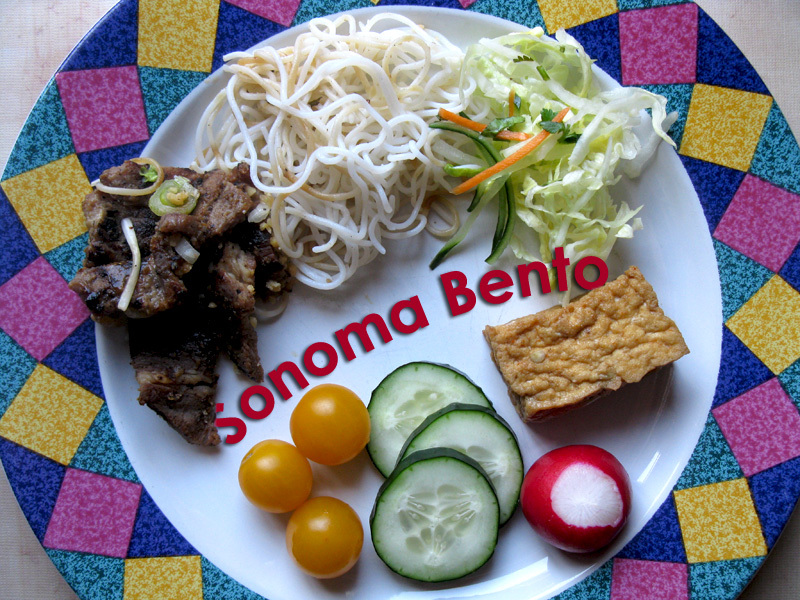 Sonoma Bento: How Does That Bento Fill You Up? I am giving myself a refresher course with Maki's Just Bento online course. So far it has been really fun! The course is designed for people new to bento, but since I fell behind on bento making for a while, I think this is a good way to reinforce good bento skills. Lesson 2A is called What Do I Put In It? 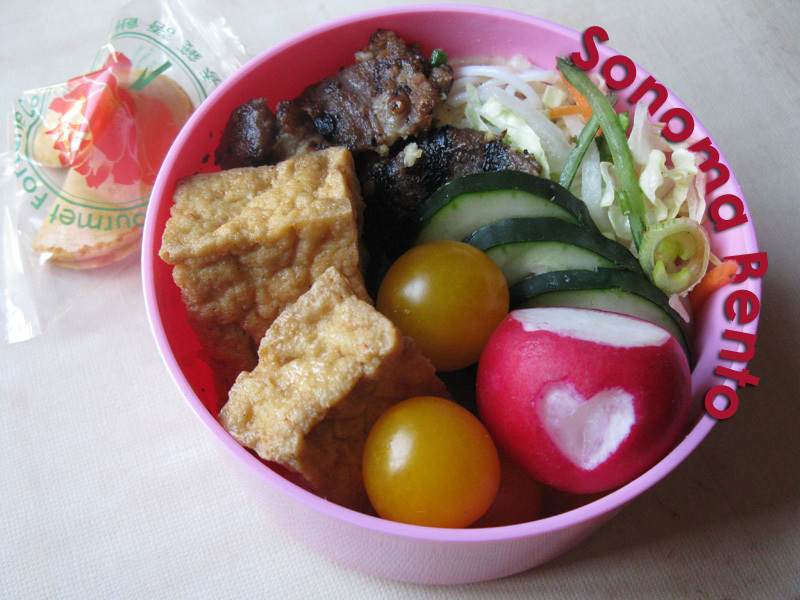 In this bento: two pieces of leftover crispy fried tofu from Goji Kitchen, leftover grilled pork with rice noodles and some lettuce also from Goji Kitchen, three slices of cucumber, a radish, and four yellow cherry tomatoes. I had the fortune cookie in this picture, but I actually forgot to take it with me today for lunch! Here are the ingredients spread out on a dinner plate, and actually, I was able to fit one more cherry tomato and one more slice of tofu into this bento box! Spread out like this, it looks like a normal portion of food for lunch. And I felt perfectly satisfied after eating this, not deprived at all. 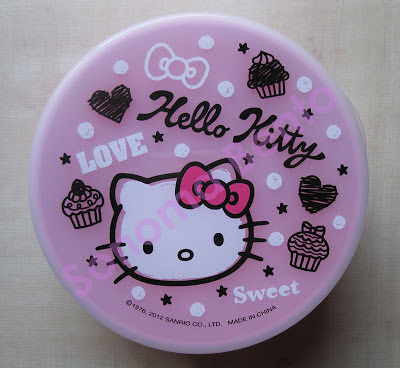 Here is my ADORABLE Hello Kitty bento that I picked up in SF Japantown the last time I was in the city. This came in a set of three boxes, each one a bit smaller than the last. The big box was too big, so I chose this one, which is big enough to hold 300ml of food. Maki has posted the next lesson in her Bento 101 course today, which deals with finding the right kind of bento box for you. I think I find TOO MANY right kind of boxes for me, ha ha. But they are sooo kawaii!! I encourage you to check out the courses on JustBento.com because I am sure you will learn something new. I have also included this bento in Shannon's What's For Lunch Wednesdays blog. See more great ideas for lunch inspiration! Thanks Sheri! yup, people usually don't take into account the depth aspect of a bento box. This has been a fun course! I to sometimes think that wow, it's a small box but actually then Y try to imagine it on a plate. and actually it looks like normal lunch. And I don't overeat. and that's important for me. what is more I can actually see the ratio between veggies, meet and rice or noodles. Ratios are super important, and I think that bento really helps you make that work. Love how you have done the visual comparison, I suppose with the right sized bento box it helps with portion control too. Yes, and choosing the right box for the right meal. A bigger bento box is good for big salads, but leftovers like this fit in a smaller one.